Both here and over at Go Overseas, I write a lot about teaching abroad in China, and I get a TON of questions on the topic. So out of curiosity, I decided to survey hundreds of people (literally) about their biggest worry or concern when it came to teaching abroad in China. Visa rules and regulations were always right there at the top of the list. I started looking into the information out there, and I realized that everything online is either WAY too vague (and missing valuable info!) or just extremely dense and complicated. No wonder everyone is confused! I get it, the visa rules and restrictions can be super confusing, especially since half the articles on this topic leave out a TON of valuable information, including ways to get around the “native speaker” element, what kind of TEFL you need, degree authentication and more! Personally, I like to pride myself on my innate ability to make super complicated things easy, and after five years of living in China and 6 years of writing about it, I’ve become sort of an expert on the topic of visas. I should be, considering I have TEN Chinese visas in my passport (I counted). So in this post, I’ll be covering who exactly is legal to teach in China, the documents you need to teach legally, and how to apply for that work visa! Who is Legal to Teach in China? The first way to teach legally in China is to become an ESL teacher (English as a second language). 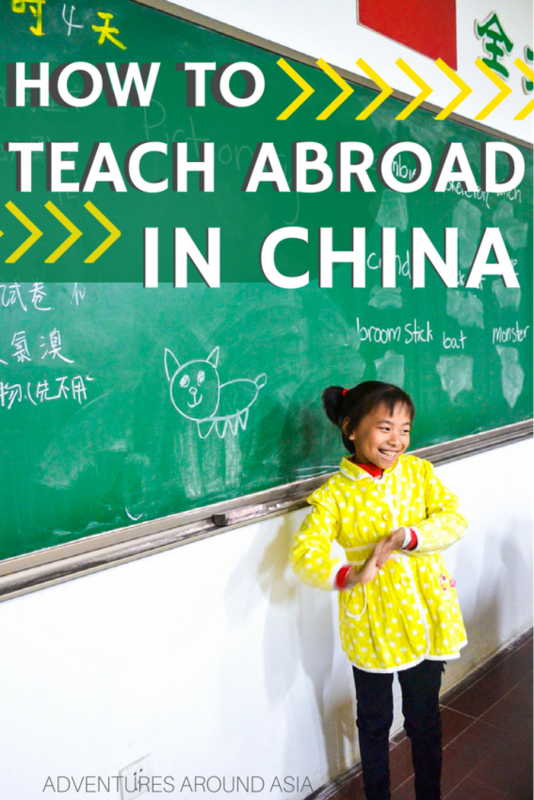 This is the most common job people think of when they picture teaching abroad in China. Most ESL teachers will either be working at a public school, private school, or training center teaching oral English. For those of you who are not from one of the seven “native speaker” countries, there is another way to teach legally in China! Anyone who is a certified teacher in their home country with two years of teaching experience can teach abroad in China. When I say “qualified”, I’m not talking about the TEFL or CELTA. A qualified teacher is someone who is legally qualified to teach in their home country (or another similar country). If you have your teaching certification and are legally allowed to teach as a professional back home, you can teach abroad in China! These teachers often work at international schools, international curriculum programs, or at high-level training centers, often teaching a subject IN English. As a qualified teacher you can teach math in English, science in English, business in English, history in English, or… you know, advanced English. The world is your oyster! Authenticated degree? Background check? Age restrictions?? I know, it can be a bit confusing. So let’s break down all the requirements so you know exactly what you need to legally teach in China. I get it. This “native speaker” rule is the worst. Firstly, there are so many native speakers of English that AREN’T from one of those seven countries: The Philippines, India, Singapore, Nigeria, Tanzania… not to mention so many people who are perfectly fluent in English that happen to have a different passport. I really wish I made the rules, but unfortunately, the Chinese government doesn’t consult me. (Wouldn’t that be awesome if they did though?). Thankfully, you can get around this legal requirement by getting a teaching degree in your home country. For many people, this will only take one year! While you’re technically supposed to have two years of work experience post-teaching certification, many jobs can find ways around this, especially if you’ve taught or tutored before you got your certification. This is another one that people struggle with. To have pretty much any job in China, you’ll need a bachelor’s degree, which should be either 3 or 4 years, depending on where you’re from. If you don’t have a bachelor’s degree, you can still teach abroad in China, however, you won’t be teaching legally (more on that later…). Due to some schools faking diplomas, the Chinese government has now instituted a system of authenticating bachelor’s degrees, which is something South Korea has been doing for quite some time now. Basically, you’ll need your degree notarized by a notary public. Then you’ll get it authenticated by the relevant government authority, and submit it to the local Chinese embassy or consulate for approval. You can read about the step by step process here! To get that legal visa, you’ll need some sort of certification: either a TEFL, TESOL, CELTA or Teaching Certification. Personally, I recommend going for a TEFL over a TESOL since it’s much more recognized in China. However, if you do have a TESOL you should be fine if you’ve done your research on which one to get. CELTA is a brand of TEFL from the University of Cambridge and is recognized as being the “best TEFL” because it’s much more intensive (and expensive). However, most schools actually really don’t care which TEFL you take, as long as it’s accredited and at least 120 hours. This is why I personally recommend getting your TEFL online, which is BY FAR the most affordable. My go-to TEFL provider is MyTEFL, which offers a 120-hour accredited TEFL that works for China. I’ve sent hundreds of people (literally) their way, and everyone loves it! If you do decide to get a TEFL with MyTEFL, be sure to use my discount code ASIAADV for 35% off! To teach legally in China, you’ll also need a clean criminal background check to show you haven’t committed any major crimes or felonies. Don’t worry too much about a few parking tickets or very minor infractions. The main thing they’re looking for is an actual criminal record. Each country has their own process for getting a criminal records check, so be sure to do some googling. Some countries will let you do this online, whereas others will need you to come in for fingerprinting. In the US, the process is pretty easy: just go to your local police station and ask. However, some schools do need an FBI background check, which requires fingerprinting and can take 12-14 weeks! This is one item that often gets left off the list. China does have a requirement that foreign workers cannot be over the legal retirement age in China. For most provinces, that’s 55 years old for women and 60 for men. I’m not sure why the ages are different (sexism? reverse sexism? ), but this tends to be the case. If you want to work legally in China, you’ll need to apply before you hit the age cutoff, otherwise, you’ll need to work on a tourist or business visa. Honestly, I really have no idea why they made this requirement since there are so many incredible teachers that want to move to China post-retirement. But I don’t get to make the rules (unfortunately). The medical check is an examination you’ll have done after you’ve arrived in China on your Work Visa while you’re applying for your Residence Permit. I’ve had this medical check done a few times, and it’s always the same. You run around to a bunch of different rooms having standard and bizarre tests done (ECG? Chest X-Ray?). You honestly don’t need to be worried about getting denied for having a minor health condition. The only time I’ve ever heard of people getting sent home is for having HIV. Usually, this person has actually contracted HIV in China from a local and finds out when they have the medical check done. This is super hypocritical, but the Chinese government has a really harsh (and archaic) view of STIs that I don’t see changing anytime soon. Get the Free Teach Abroad Mini Course! In order to teach legally in China, you’ll need to be on a WORK VISA (not a business visa). Once you arrive in China, this Work Visa will be switched to a Residence Permit, which will allow you to stay and work in China, coming and going as you please for at least a year. Obtaining all of the documents for a Work Visa will definitely take at least a month or two, which is why I always recommend applying EARLY, especially if want to work at a school that starts in September (as opposed to a training center). To make things easy, I’ll outline the process for you. While this all will seem a bit complicated, don’t freak out! Your school or recruiter will help walk you through the entire process. This will definitely take you a few weeks, so I would suggest getting started on this step before you even have a job lined up (if it doesn’t completely overwhelm you). Again, check out this article on how to authenticate your degree depending on what country you’re from. If you’re from the US, there’s a chance that your university can notarize the degree for you, depending on what state your university is in. But for most of us, this will involve getting your degree notarized by a notary public, getting it authenticated by a specific government organization, and then submitting it to the embassy or consulate. Go to the relevant authority and get your background check early too! For most of us, the process is short and sweet, and will only take a few days, or at worst, a few weeks. But for some countries like South Africa, this process can take quite a while (over 2 months!). For those of you from the US, some cities require FBI background checks (looking at you Shenzhen), so if you know you’ll be applying to a city where it’s required, definitely get started early! Once you have your criminal background check and degree authentication, you can send this, plus your TEFL certification and any other documents your school requests. Don’t worry too much about this, your employer will walk you through everything. Your employer will take all of these documents and use them to apply for a Foreign Experts Permit (otherwise known as Work Permit). They’ll also issue you a formal letter of acceptance. Once your school sends you the Foreign Experts Permit and the Letter of Acceptance, you’re ready to apply for your work visa! Just print out the visa application form, get a passport photo and copy of your passport, and apply at your nearest consulate/embassy or in Hong Kong. 5. Arrive in China and Get That Residence Permit! Once you arrive in China, your school will start you on the process of getting your Residence Permit. This will involve getting a Medical Check, and heading down to the Foreign Experts Bureau with your passport. The Bureau should keep your passport for around 2 weeks, and when you get it back, you’ll be a resident! What If I’m Not Legal to Teach in China? Maybe you don’t have a degree, or you’re not a “native speaker” with a teaching qualification, or you’re over 60 years old- whatever the case, there are plenty of you who really want to teach abroad in China, but just don’t meet the legal requirements. I know this can be really frustrating, especially if you have teaching experience. Just know that it IS possible for you to work in China… you just won’t be working legally. Many schools in China think that the red tape surrounding teaching in China is a bit too extreme. All they want are teachers who speak English fluently and teach well. These schools are often willing to overlook the requirements and hire you on a tourist or business visa. Just keep in mind that this is definitely not legal in China. You’ll need to be super picky when selecting a school to work for because you don’t have the same legal rights as those working in China legally. You’ll also have to leave the country every 2-3 months on visa runs, and there is a very small possibility that you will get caught and be deported. While this topic is definitely a post for another day, just know that I have many friends who work part and full time on tourist, business, or student visas, and I don’t know anyone who has ever been deported. Just be smart about it, don’t broadcast your work status, and you should be fine! What do you think about these visa rules? Is everything clear? Do you want to know more about the laws, how to get a visa, or teaching illegally? Let me know in a comment below! « What If Your Chinese School Doesn’t Pay On Time?